Sauteed Zucchini and Squash Recipe - Mom. Wife. Busy Life. The fall is the season for cooking over here at my house! I love to get creative in the kitchen with a variety of ingredients including vegetables. I try to make a healthy side to go with dinner for the family every night, but sometimes I run out of options and ideas. Zucchini, squash, and onions are one of my favorite go-to side dishes when I need to serve something healthy, quick, delicious, and easy. 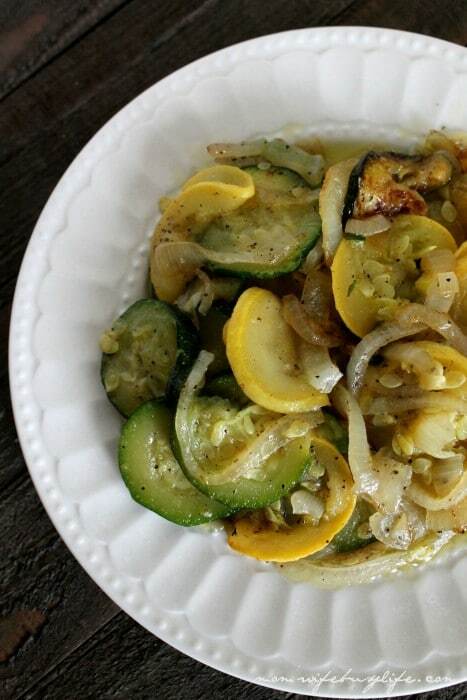 If you are a busy mom and you are looking for an easy and delicious recipe to serve for your family, try this Sauteed Zucchini and Squash recipe! Thinly slice the zucchini, squash, and onion. Discard the ends of each. Consider investing in a vegetable slicer for easy and quick slicing! In a skillet, combine all ingredients and mix well. Here’s my favorite skillet that I use regularly for most family dinners. Cook on medium to high heat for about 5-10 minutes and stir regularly until all vegetables are slightly browned. I use 2 tbsp. of margarine and i put 1 tsp of minced garlic. It is phenomenal! !